"I’m in awe by the truly impressive team of Go Givers that helped deliver Smiles for Everyone to so many in need"
This past weekend, our team of volunteers delivered Smiles for Everyone at the Smiles for Everyone Foundation’s last Day of Giving event in 2018. Providers and support staff from near and far gathered at Bright Now!® Dental in Oakland, CA to deliver pro bono dental services to the local low-income community. Volunteer providers included Dr. Mudita Agrawal, Dr. Wei-Yi Chao, Dr. Eunice Gonsalves, Dr. Farzin Khashayar, Dr. Manali Mehta, Dr. Nasreen Nangoli, Dr. Du Nguyen, and Dr. Sarika Sood. 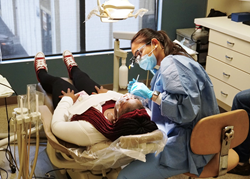 Our Day of Giving events would not be possible without the help of local nonprofit organizations, which prescreen and refer patients such as Lupita to the dental clinic. Our partners included East Bay Innovations, which provides disability services; MISSSEY Inc., which supports victims of human trafficking; and East Oakland Community Project, which offers transitional housing, and more. We look forward to delivering many more Smiles around the country and overseas in 2019! Bright Now! Dental provides general dentistry, children’s dentistry and, in select locations, specialty care services such as orthodontics, oral surgery, periodontics and endodontics at over 150 offices across Arizona, California, Colorado, Florida, Indiana, Maryland, Ohio, Oregon, Pennsylvania, Utah, Virginia and Washington. Bright Now! Dental’s Oakland office is operated by Leng C. Haong, D.D.S., Inc. (the “Group”). The Group is affiliated with Smile Brands Inc., one of the largest providers of business support services to dental groups in the United States. Smile Brands Inc. provides comprehensive business support services through exclusive long-term service agreements with affiliated dental groups, so dentists can spend more time caring for their patients and less time on the administrative, marketing and financial aspects of operating a dental practice. Smile Brands is a portfolio company of Gryphon Investors (“Gryphon”), a leading middle-market private equity firm based in San Francisco, CA. For more information, visit http://www.smilebrands.com.